LAS VEGAS, NV — It is no secret that AMD's Threadripper multi-core processor is a beast goes without saying and 16c/32t of computing power is nothing short of impressive in the desktop marketplace. 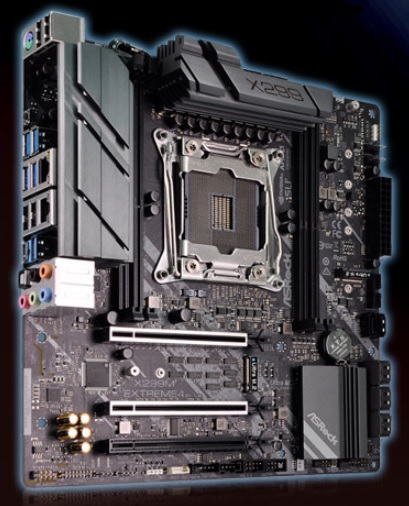 Going the extra mile when it comes to providing 'power' users multiple options in regards to form factors, ASRock has unveiled their new microATX TR4 socket motherboard at CES 2018 in Las Vegas, the ASRock X399M Taichi. The ASRock X399M Taichi is the worlds first AMD Threadripper supported motherboard and allows users to run a microATX system with AMD's EPYC based Threadripper processors including the AMD Ryzen Threadripper 1920X ($799) and 1950X ($999). The details regarding the X399M Taichi are vague at best, but what we do know is the board is stacked with an eleven power phase DR.MOS design, three full length PCIe 3.0 x16 slots in addition to three ultra fast PCIe 3.0 x4 M.2 slots; in addition to these, the X399M Taichi features a single U.2 connector. Also included is a duo of Gigabit Ethernet ports including Wi-Fi capability, as well as carrying four RAM slots due to the reduction in size thanks to the smaller form factor. Pricing is expected to be a little higher than ATX version, the ASRock X399 Taichi which retails for $339. Technically, that's actually not true at all, as Threadripper has full support for high & ultra-high capacity DIMM's (supports up to 128GB in each DIMM slot). 32GB DIMM's won't be at all cheap, or come in crazy high clocks (2666MHz is likely the best you'd get for the stock clocks, so 2800 when OC'd with extra voltage should be possible, but nothing crazy by any means; dual-rank sticks are hard enough to push far with 1st gen Zen, so quad-rank high capacity DIMM's are likely to be even harder (and I dunno if 32GB DR sticks exist yet), but fitting 128GB in that board is totally doable with today's tech.